In this post I share a tip I use to launch Pocket and start reading in no time. Instead of opening Chrome then navigating to the Apps tab and launching Pocket, I resorted to creating a shortcut of Pocket on my desktop. First start by installing the offline app and launching it. Immediately Pocket will start downloading your saved articles to your local computer so you can read them offline. You can leave it downloading while we create a shortcut. Here is a screenshot of my Avant Window Navigator on Ubuntu. This is the result we wish to meet. A really nice feature that comes with Chrome is the ability to create an app shortcut on your desktop. To add a Pocket shortcut to the Avant Window Navigator, open the Apps tab in Chrome, right-click on the Pocket app icon and click Create Shortcuts. You will be asked to choose whether you want a Desktop shortcut or Applications menu shortcut. Choose Desktop. Afterwards just drag and drop the created shortcut over the Avant Window Navigator. That’s it. It’s done. 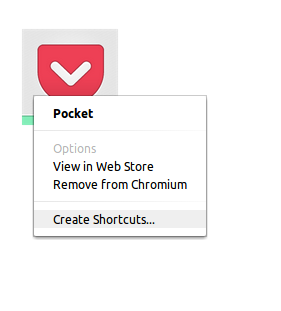 Clicking on the shortcut will launch Pocket in a new Chrome window. Evernote: As an Evernote user I often want to save some quotations or selections from articles. If those selections are long I share the article with Evernote then read the article on the Evernote app and remove everything I do not need. Kobo: Though I don’t use my Kobo touch as much as I used to before getting a tablet and a smartphone (the tablet increased my reading; I read 698,614 words in Pocket in 2013) but I just updated the firmware and discovered (online) that Pocket is now integrated with Kobo. Pocket articles can now be synced with Kobo. Do you find the Pocket app for offline reading helpful? Do you have any reading habits and tools to share with us?